The highlight of the golfing year once again was the Staff v Students Golf Match which took place on the Wee Monty at The Royal Golf Club recently. Having arrived in the pouring rain the heavens relented and we had three hours of perfect sunshine. That was until the end when there was a massive rain storm which Mr Milnes got caught in and looked like he was taking part in the swimming gala rather than a golf match!! 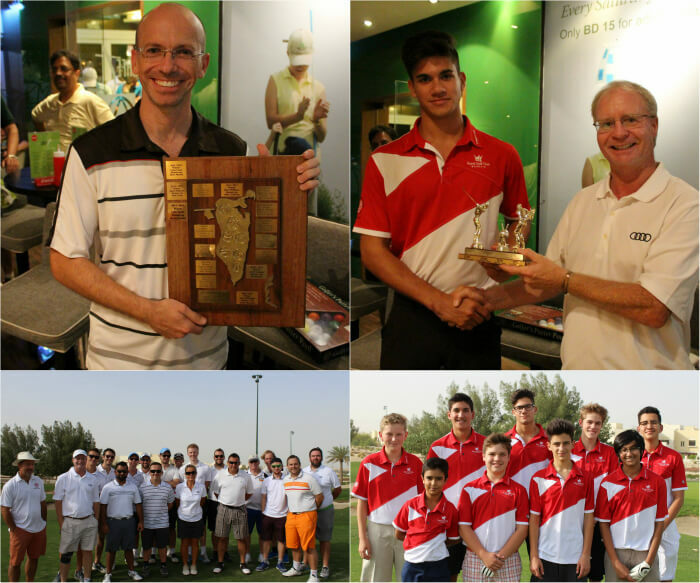 In a very close match, Mr Hobday & Mr Wales lost to Faris Brough & Nayel Al Borshaid on the last hole whilst Mrs Hobday & Mr Rowark lost 7&5 to Sebastian Woodrow & Ronan Smith. Mr Teague & Mr Plunkett also lost to the students by 3&2 which gave the staff a mountain to climb. However, victories by Mr Armstrong & Mr Coast, Mr Stewart & Mr Pollard and Mr Ali & Mr Milnes meant that the final score was a 3-3 tie! The overall score now stands at 10.5 – 4.5 to the students. In the staff competition, Mr Stewart won with a massive 51 points, closely followed by Mr Jones on an equally impressive 50 points and Mr Philpotts on 46 points. Well done to everyone who took part and we look forward to next year’s match where hopefully the staff will try and win the trophy outright this time! !